With Earth as collateral damage, the Kryptonian deity called Rao has the Justice League on the ropes! The Flash manages to escape from Rao's clutches, whilst green Lantern sits in a cell on Argo, attempting to reconnect with his ring. Wonder Woman tries to revive Superman to no avail. Frustrated at the appearance of his death, Wonder Woman thrusts her lightning bolt at Superman's lifeless body, which brings the Man of Steel back to life. The Justice League's rejoicing is cut short, as they realize that Rao has bought Krypton to Earth. Story - 5: I have a confession to make. When this book was first solicited, I was not reading current comics at all. I had walked away from them in 2013, as I felt that they were no longer for me. So I missed out on the first 8 issues of this series... And boy do I feel like I missed out on something truly fantastic. Granted that this is chapter 8 in what was intended to be a 12 part story. I can't help feel like I was stupid for not having read this earlier. So far the Rebirth books have been outstanding. I seem to pick up a few more titles per week. DC is sucking me back in... And you know what... I aint even mad about it! This book is still set Pre-Rebirth... So technically New 52, so it may have gotten delayed in the company wide new direction; however it was still a great read. It felt like not having ever watched any of the "Star Wars" movies, and then watching the first half of "Return of the Jedi"... I need more! I like the way the Flash (who gets a majority of the screen time) seems to be the heart of the League, but also the guy that gets things done, when backed up against a wall. Hal's will power, being significantly weaker than that of Rao's, is not enough to bury his "never give up" attitude. He may be locked up and held prisoner. But he keeps trying to connect with his ring. Even when all hope seems lost for him. This is why he's considered one of the greatest Green Lanterns. I was really intrigued by Hitch's antagonist, Rao. I especially like the fact that there are two versions of him. One from the past, and the other from the far future. Both coexist alongside each other, at the same time with a complete reversal of viewpoints and intensions. This is not a new concept in comics, but one that is written very smartly. Rao is not a god... He's a power hungry and delusional person that suffers from grandiose delusions... The only downside is that he now possesses power enough to back up his claims. Finally Wonder Woman's attempt at reviving Superman, and succeeding in doing so. This felt like one of those moments you knew what was coming, but were still surprised when it happened! I really enjoyed this issue, and am now going to go back and read the first 8 issues. Hitch joins a very few elite group, that excels at writing and drawing a book. Art - 5: Yes, I graded this issue a 5. Now after reading many reviews and comments online in regards to how "Bryan Hitch" can't draw as good as he used too when he worked at marvel on the Ultimates, let me point out the fact, that Hitch took on a bi-monthly schedule for that book to make it look as good as it did. Hitch may not put in the level of detail that he did in the past books, but his page layouts and compositions are as sharp as ever. Just take a look at the opening page. The urgency in all the characters on the page. The facial expressions and the body language on all the characters. You really don't need words on the page. Now let's take a look at all the pages that feature Green Lantern. The mood of desperation and hopelessness emotes from every panel. 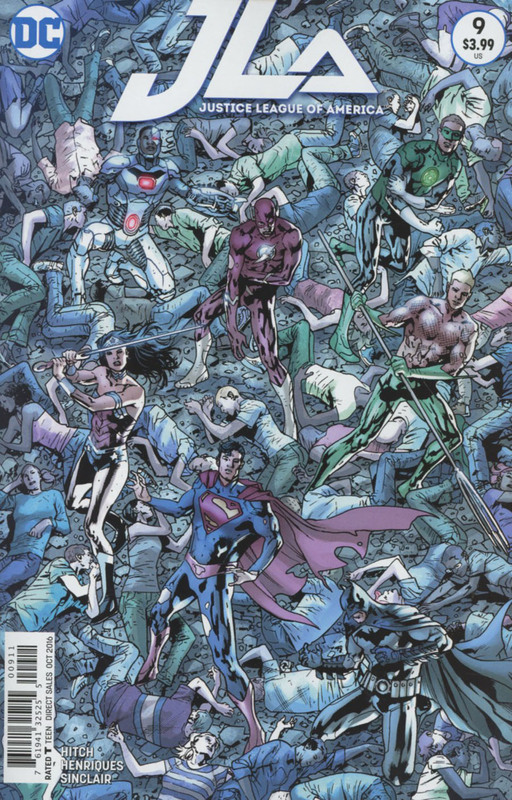 Finally the pages of the rest of the League and Superman's lifeless body, combined with Diana's desperation in trying to revive him. So much heart and emotion. Hitch makes the League look like legends simply through his art. It's one aspect of being a writer/artist that Hitch is able to use to his advantage, and make a gripping and suspenseful issue.Hitch is a true comic art master. I use the word cinematic a lot in my descriptions of art in books I'm fortunate enough to review for the homepage. And modern comic art is indeed very cinematic. But it was Bryan Hitch who along with a very few select others, that bought about this trend in the early 2000s. And Hitch brings that grand look in his art to this book. I feel grading this book lower than a 5, seemed unjust. Hitch's long-time collaborator Paul Neary's inks are absent from this series. However Daniel Henriques inks do the trick. Combined with Alex Sinclair's inks. This book is a Technicolor dream! Cover Art - 4: This cover has a great composition. The League standing amongst the carnage befallen them. I especially like the fact that all the characters are not staring at the camera. The only downside I feel is the coloring. It looks fairly washed out, even the League members don't stand out. 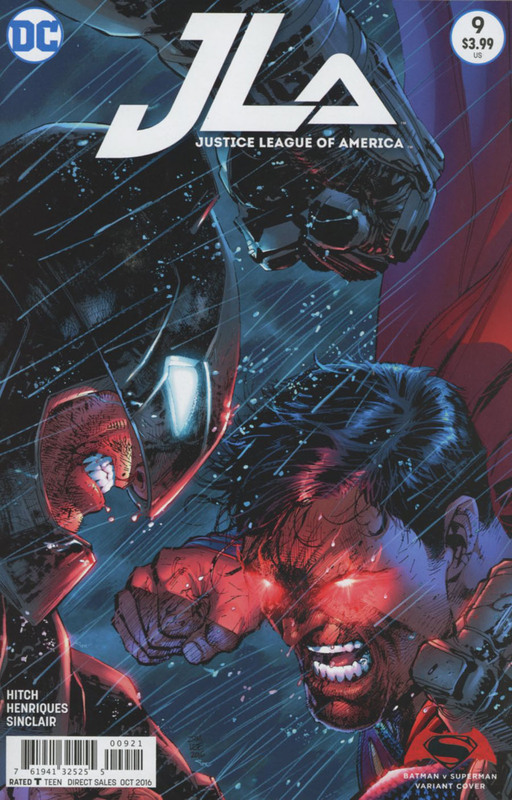 Variant Cover Art - 5: The "Batman v Superman" tie in cover, though many months late, still looks great. Jim Lee delivers once again, I love the close up of the faces. A very different and intimate view of the battle of the Worlds Finest.